Being organized is the key. If you are not organized or if you are not able to do time management, then try and learn it slowly. Start it with little things and then move to the bigger one. Organizing the work and then managing the time is the best way to turn your weaknesses into the strengths. If you know you are bad at managing the work according to time, means you fail to understand the importance of time. So, be organized. If you are bad at one thing, does not mean you are bad at everything, but yes, certainly you can make other good things, you go bad only by hiding the weakness and not working on it. So, if you are bad at writing, then start practicing it on a daily basis so as to get a grip on what you are bad at. Only practice will make you perfect. If you have some or the other weakness, then do not hide it, even if others point it out. Just try and take it as a healthy criticism and improve it. Sometimes the criticism helps in motivating and the motivation is a driving force for working good and converting weakness into the strengths. You know you have a weakness, then do not jump directly to the last step of reaching perfection. Move slowly, take baby steps and you will win over the weaknesses you have. You want to turn out victorious, then have some inclination towards the correction of those weaknesses. In case you are not able to help yourself with combating your weaknesses, then ask others to help you out. Asking the close one’s your friends, relatives and others whom you think will never say no to assist you, go to them, ask for the pittance of help they could do to you. It will help to know your faults and if you are familiar with your flaws, then you can certainly work on your weakness. Do not atop anyone from finding faults in you. Do not feel embarrassed, if someone interrupts you and say that you are wrong here. Do not feel bad if someone says you were bad at this. Just feel happy that there is someone to tell you that you were wrong at that point. Ask for more faults and you will see great change in you, realizing you have more of strengths and no weaknesses. Do not turn stubborn. It is considered negative. Just turn your stubbornness into dedication. Only if you are dedicated to work towards your weakness, then only you will be able to accomplish your task. Show your dedication towards what you desire for, or nothing will help you out in showing your best. If you can have a positive attitude and firmness of buying new trend, thinking it will certainly suit you, then why can’t you have a positive attitude while you try and work on your weakness. When you are starting with the same, just say that you will complete it for sure. From arrogance, move towards the confidence. Only confidence will help you do things in a better manner. Just be confident and start with the attitude that you can do. Yes! Attitude is best to attain and the easiest way to achieve something. Be passionate towards what you do. Remember not to be impatient, just be passionate with what you encounter at work. Passion will keep you awake to do a lot of hard work and this will prove to be your best friend, making no complaint and no demand. Also passion will help you all way long in the life ahead. Do not hesitate to tell what you are bad at. If you will tell people about your weakness, you will be able to confront them as well by saying you will improve it the very next time. So, do not shy. Just be bold enough to accept the weakness. Once you yourself accept your weakness, you will encounter it. Enough time does not necessarily mean three hours a day or more. Giving time to your weaknesses is working even for half hour will do lot good to you. So spend at least a half hour in practicing what you are bad at or what you do not know. This will give you an edge over your weakness. It is not a child’s play. You will have to practice on the regular basis. Everyday is giving some time after the whole other chores, you can make up to what you want to overcome. Regular exercise regarding the overcoming of weakness will assist you in knowing what extra you need to know and also consulting any of the friend or expert over it, will act as an icing on the cake. Consulting the expert in the field you are bad at, is another best way to overcome your faults. Expert advice will help you and also give you clear ways on which you can walk to achieve edge over the weaknesses. Experts come to know the ground reality of the issue and they can better inform you regarding your weaknesses. Once you get to know what exactly was lagging behind, you will be able to know on which thing you have to work and which is to be left out. Celebrating strengths will be fine only when you are able to overcome with your weakness otherwise people will talk more about the weakness within the strengths itself and it will let you down. Do not give people the opportunity to talk about the flaws you possess. Just prove them that you are capable of turning the weakness into the strong power, hence overcoming the weaknesses. The comparison will tell you where are you still lagging. Once you catch hold of what you were again wrong at, you will try and improve it yet another time. So, do compare your present result with the last one’s to still know the wrong points. This way you will be able to achieve edge over the things you were bad at. Remember not to compare yourself with others. Everyone has some or the other faults and strengths and that comparison will make you feel down. So, compare with yourself, with your own performance only. If you are irresponsible, nothing will go accordingly the plan. Just be responsible and work with full hard work and dedication. Its your own responsibility to take a step towards the weaknesses you have. No one will ask you to correct them rather people will make fun and demotivate you. So, do not give anyone a chance to speak and comment on your weaknesses. For that you will have to be responsible towards your duties. Focus on your goals. 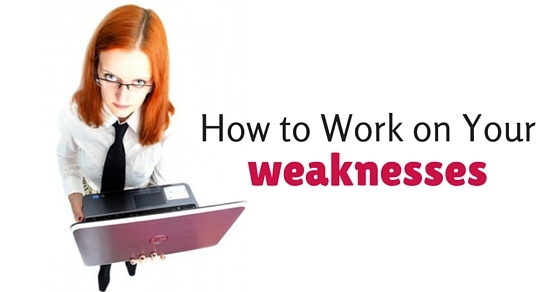 Here at this time your goal is to make the best of the benefit out of the weaknesses. Just try your best by staying focussed. If you will move astray from the path, it will not do any good to you. So, it is your duty to recognize what you want to attain and how. Stay focussed and concentrate to achieve your desired goals. So, above are some of the steps by which you can motivate yourself so as to overcome the weaknesses. Instead of cribbing on them, just work on them to make them your strengths. Once your weaknesses are converted into strengths, you will be able to achieve anything, irrespective of what others say and also the hurdles. In actual the weaknesses are the hurdles in itself,so try and kick them off so as to clear your path and attain the success. Next articleBeing Passed Over for Promotion Unfairly – What to do?